Unemployment may be at record lows right now, but not everybody is experiencing the boom. Gov. Kate Brown offered her State of the State address Monday before a joint session of the Oregon House and Senate with a major emphasis on jobs; education and jobs; and equity of jobs. It may seem like an odd focus in a state that went from dreadful unemployment during the Great Recession — hovering around 10 percent — to between 3 percent and 4 percent today. Those numbers are close to the mythical "full employment" figure bandied about by economists. But Brown's laser-like focus on jobs makes sense when you remember that Oregon's jobs picture isn't rosy for everyone. We still have great disparity between urban and rural communities. People of color and people with limited English skills struggle to find work. And the term "job" becomes harder to identify as technology rapidly changes the work environment; one joke heard around community colleges is that new high school graduates need to major in careers that haven't been invented yet. As Brown pointed out in her speech, one out of every four job openings in Oregon's tech industry is filled from out of state. While one out of every five jobs for advanced manufacturing is filled from out of state. 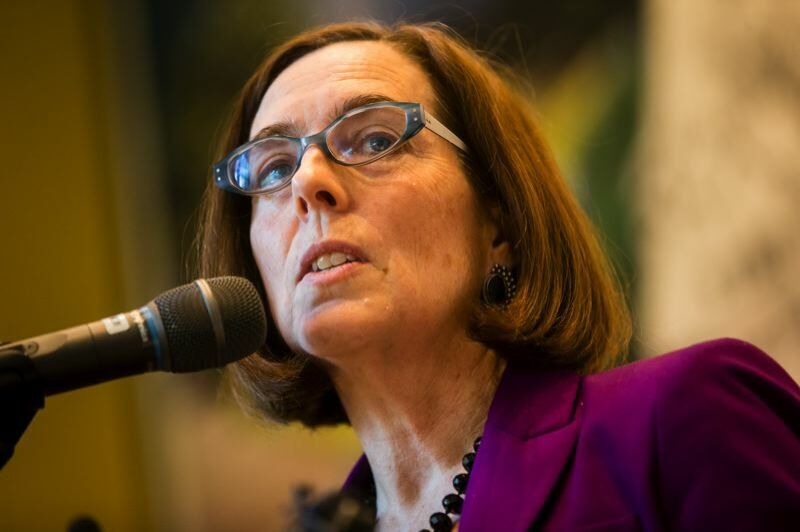 Brown wants Oregonians getting those jobs. The first priority in her speech focused on career technical education. She wants to launch a program she's calling Future Ready Oregon, in which every high school student graduates with a plan for the future: be it further education at a two- or four-year institution, or a career. She wants to invest $300 million in hands-on learning programs like career technical education in Oregon's public schools. • Changing the way Oregon makes investments so they are equitable across the state, with a higher emphasis on communities of color, rural Oregon and Oregon's nine tribes. As an example, she touted a broadband investment scheme for Oregon's rural industries. • A "Next Gen Apprenticeship" program to incentivize the creation of new apprenticeships in information technology; health care; advanced wood manufacturing; and high-tech manufacturing. • She wants the Legislature to create a bill directing Business Oregon (also known as the Oregon Business Development Department) to develop a loan program to help people in the construction industry to start their own businesses. In her words, to "turn wage earners into job creators." She wants this loan program limited to those work on affordable housing in rural communities. • Brown is directing a team to create partnerships in local communities with the business sector and private developers to address the housing shortage for working Oregonians. She said several pilot projects will be announced in the coming weeks. • Aligning training programs for entry level jobs in the fast-growing world of health care, in-home care and community-based health programs. It may sound odd in Washington County to hear the governor give over the lion's share of her speech to job creation. After all, our unemployment is at rock bottom, right? But we think there's wisdom in her focus. Oregon's economy is notoriously elastic: he does really, really well in boom times, and much worse than other states during bust times. So we'd be foolish to count on the current low-low unemployment figures staying around forever. They won't. Times are good now, so now's the right time to align job programs to make them more resilient against the next recession. Which will get here eventually. Probably faster than most of us realize. Brown's speech also had a bipartisan tone to it, with its repeated focus on rural Oregon. With all of the hyper-partisan rhetoric in Washington, D.C., these days, that tenor sounded good coming out of Salem. We hope the Legislature uses the short-session the way it was intended: For minor adjustments to the budget; to address emergencies; and to make policy tweaks where necessary. Gov Kate Brown's priority on jobs, jobs, jobs can be done without a vast expansion of new, controversial and partisan programs. It probably was the right State of the State speech, given the state of our state today.